Use this striper tool for making straight or curved lines in enamel paint, lacquer, tempera, fabric paints, bronzes, or even glue. It works on paper, wood, glass, metal — any smooth surface. Single Line Striper Kit — This user friendly kit includes eight wheel tip assemblies. 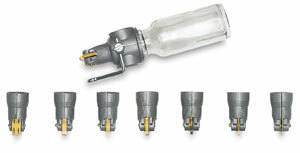 Sizes included are 1/64", 1/32", 3/64", 1/16", 5/64", 3/32", 1/8", 1/4". Includes one 1/2 oz bottle and seven replacement gaskets.